A suspicious grass fire behind Gunn High School and a kitchen fire in a Palo Alto home that caused minor injuries broke out during the Memorial Day weekend. The grass fire was reported behind Gunn High School in Palo Alto at about 4:30 p.m. Friday (May 27). Four fire engines responded and quickly doused the blaze, but the cause of the fire remains undetermined but suspicious, a fire department spokesman said Tuesday. A second, unrelated grease fire broke out Monday (May 30) at 11:30 a.m. in a home in the 800 block of Ilima Court near the Palo Alto VA Medical Center. The fire started in the kitchen and was put out quickly by residents before firefighters arrived. One resident sustained minor injuries and the home sustained minor smoke damage, according to a department spokesman. In the Gunn incident, Gunn 11th-grader Kareem Fawal witnessed the fire. He had just been dropped in the school parking lot around 4:37 p.m. when he smelled smoke. "I thought it was a BBQ for a second until I looked in the direction of the smoke and saw a fire burning on the roots of the trees and leaves," Fawal told Palo Alto Online. "I walked towards the back and saw little pieces of fire burning before I got the main source." Fawal caught the fire on video. Watch it here. 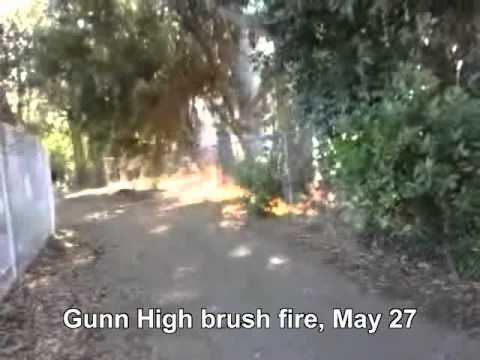 I bet half the kids at Gunn know who the pot smokers were that started the fire in the eucalyptus grove. Who is going to do the right thing and turn them in?